Welcome to this fun giveaway, brought to you by U.S. Bilby and Lil' Blog and More! What a perfect time, for such a fun prize! 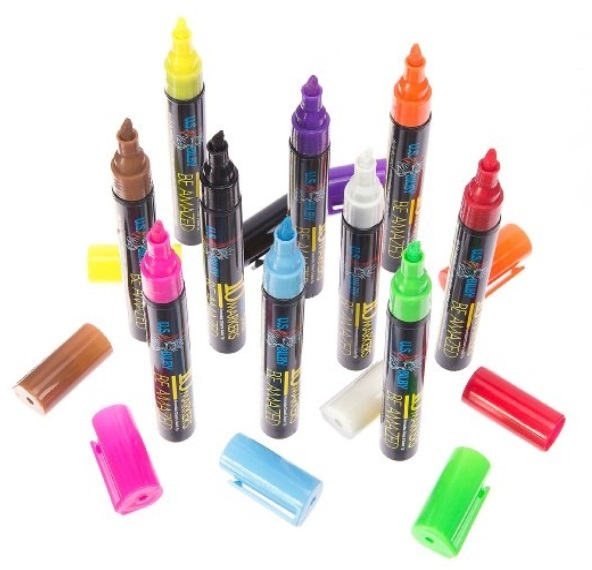 Back to school is right around the corner, and if you have a child - These chalk markers from U.S. Bilby would make an awesome addition to any class room! U.S. Bilby Chalk Markers are super fun! They're bright, easy to use, and can be used on tons of different surfaces, such as, windows, ceramics, cars, and much more. I sure wish they had sidewalk chalk when I was young. I see the kids drawing pictures on the sidewalks around here and they are really pretty good--plus it washes away with the rain-unlike the hopscotch boards we used to draw on the sidewalks. Do any of the kids still play that I wonder. You really do have to go and read the review. As for that chocolate basket---I want it---and I'm sure you do too. To win one of these great prizes fill out the giveaway form-you may be the winner of either the Chocolate basket or the Chalk. You can get 10 beautiful markers, for one low price, available on Amazon! If you'd like to see more, be sure to check out Lil' Blog and More's original review. name will be announced on the GiveawayTools form. Open to US residents only. I received an entry in the giveaway form for helping to promote this giveaway. If there are any affiliate links they are NOT those of Miki's Hope. All opinions expressed are my own honest opinions. For more information please check my Disclosure Statement. Our giveaways are in no way sponsored or promoted by Facebook. I saw this on Twitter and came over to enter. Excellent prizes! I like the blue the best then the purple then the yellow. I like the blue color it reminds me of the ocean. I like the purple and blue. Sorry can't decide between the two...they both just seem to pop. I absolutely love that shade of purple! My favorite color! I really like the Neon Pink marker. But they are all bright, pretty colors. My favorite color is the Neon Green! Green is my favorite color!!! I like the orange one best. It is bright and cheeerful. Who could say no to chocolate?!?! The Pink is pretty. I think I like that one.